Easy Elegance is Sharon’s (aka notimetostamp) challenge today. This is my sample for it. She said simple, and clean, with a few key embellishments. I think this fits the bill don’t you? Clean, simple with a few extra touches. Not too over done but embellished. I was in the mood to take photos at my window lately. Just mix it up a bit. Plus the greenery in the back brings out the green in the image-right? LOL! 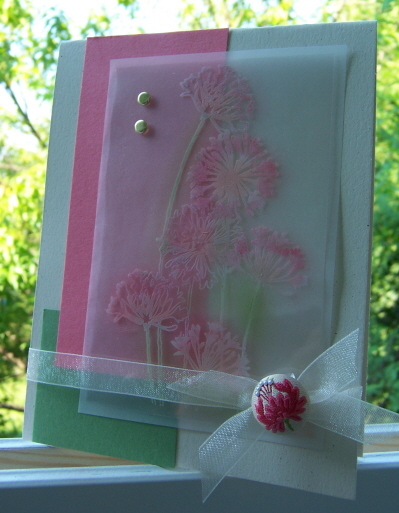 I used Natural Ivory for this card. I love it much more than plain’ole vanilla cardstock. More professional looking IMO. Im totally LOVIN Wasabi! Who would have thought. Its really a nice green. I HATE Garden Green and this is a much better choice for SU! The other panel is Guava. I LOVE the Agapanthus image from Stampendous. Its just so pretty. As are alot of their natur images I ahve accquired. So here is what I did….. I stamped the image with White StazOn onto an acetate sheet. I then used my Poppin Acetate technique, with my Pebbles Pearlescent chalks. So the image shimmers IRL. LOVE those chalks. Haven’t touched my SU! ones since. I have both sets. Once that was done, I layered the acetate onto a vellum paper layer (NOT vellum cardstock cause its a little more frosted than vellum PAPER). I attached the two layers using glue dots under the flower images. Adhered that layer with gold brads. Attached it all and then tied witha sheer ivory ribbon. Over the knot I attached a fabric brad by K & co. So that is my version of EASY elegance. This card really only took about 15 min to make. Not too shabby. 8 Responses for "Easy Elegance"
I’m more of a lurker than a ‘commenter’, but I have to tell you that this card is gorgeous!! And to be such a quick card as well! I’m going to have to find this stamp and case for sure! I get regular updates through Google Reader and I just love your blog. You are truly an inspiration – and not just for your awesome artistic talents! You have convinced me, I need to this with the stamp you used. I, too, like that particular stamp and have got my monies out of it. Great card. Absolutely beautiful. I have two unopened packages of those brads (they are so stunning) but can’t figure out to use them now that I have them… this card gives me great inspiration…love the idea of using the brad as a ribbon anchor. Thanks for sharing. so pretty Lauren! I’ve only done a couple of the challenges so far, but I’m planning on doing all I can and the elegant one is on my list for this evening. I am so loving this dirty dare fan club challenge thing! Don’t know if it was easy but it sure is elegant! You are one talented card maker!! I enjoy your blog!